Happy New Year! May your team play hard, win often, keep a ready bullpen, and always recover quickly from bottom-of-the-9th, two-out, tying-run-on-third heartbreakers. Thank you to those many people who made me both love and understand baseball, including Thomas Boswell and his Washington Post columns, and my friends Jay, Jim, Renee, and Editor/Husband Randy who will sit through long rain delays, and games played through sleet, cold, my bouts of heat exhaustion in summer, leaky bullpens, and late-inning meltdowns in the outfield. I’ll see you at the game … or I’ll see you in November. Play ball! This entry was posted in Baltimore Orioles, Baseball and tagged Baltimore Orioles, Opening Day, Thomas Boswell by Jackie, The Baseball Bloggess. Bookmark the permalink. Love this. Let’s go O’s. Could be an unexpectedly good year … on pace to hit NO home runs, yet win 162 games. Plus, a cake disguised as a pie. What other team can do that? (Rhetorical question. No other team, of course.) 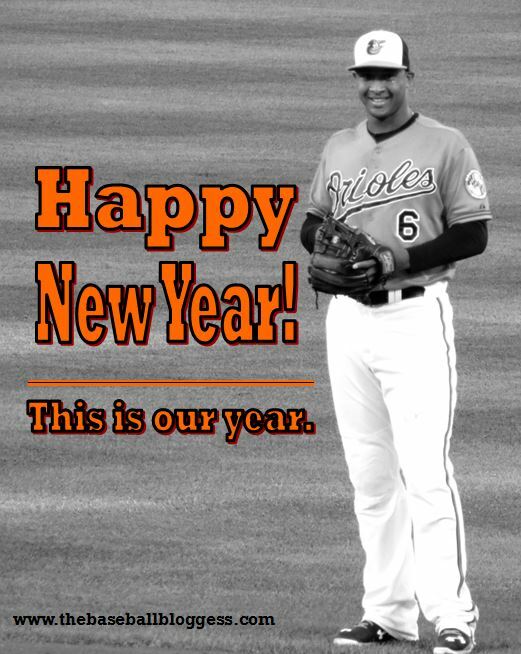 Go O’s! To be fair the meltdowns in the outfield are mostly from watching college ball. The Orioles are more of your meltdown-on-the-mound variety. I’m so glad baseball is here once more. Good luck to your White Sox! Yep, those days of baking in the sun are long behind me now! I’ve grown fond of having shade around and plenty of water at hand. I don’t get out to the ballpark nearly as often as I did in my young and foolish days, so the chances of having any difficulties are pretty slim. Now, I usually enjoy my team’s exploits–meltdowns and implosions and successes–via radio or TV. I’ve been up past midnight the past two nights enjoying the season- opening wins against the A’s. The lack of sleep has been worth it! Happy Opening Day! I wish you an exciting and enjoyable season! Good luck to the O’s in the East. And, good luck to your Tigers, too! I’m so glad baseball is finally back … it’s that wonderful time of year when both MLB and college ball are on the calendar! O’s win a tight one on opening day. That is a good omen. In Cleveland , they only saw snow. Happy New Year, Precious! I love this time of year … when all things are possible, even a World Series!